Across the bustle of Venice's Grand Canal, away from the over priced, selfie-stick, tourist craziness of St Mark's Square lies the district of Dorsoduro. This is one of my favourite areas of Venice, beautiful, peaceful, with a great selection of museums, galleries, churches and bacari that serve modestly priced ciccheti and wine. 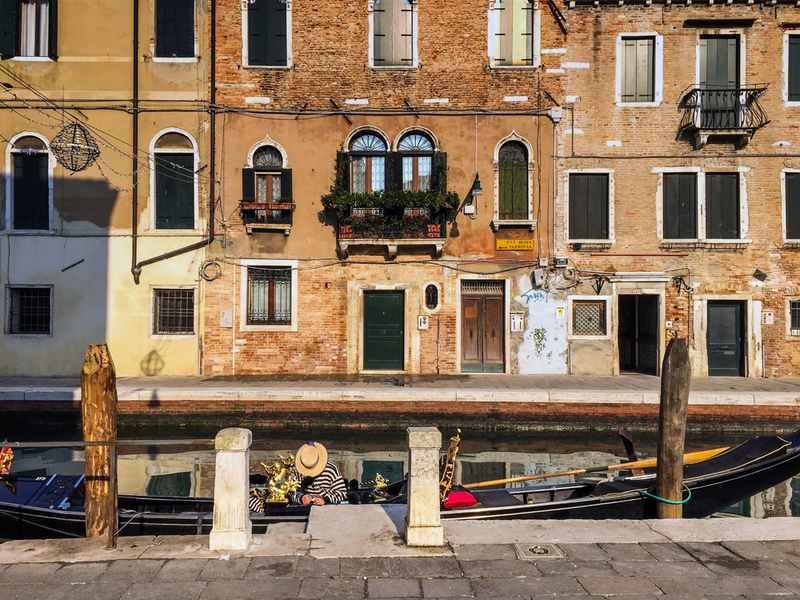 Just a short stroll from the Accademia bridge lies the small square of Campo San Barnaba; a beautiful haven with street cafes, shops, gondolas and a floating greengrocer barge selling fresh produce to the locals. On one of the first visits that Katrina and I ever made to Venice we made it our mission to find this location. It was here that memorable scenes from David Lean's Summer Madness (or Summertime as it was titled in the US) were filmed over sixty years ago. A favourite with both sets of our parents, I have distinct memories watching the film on TV as a child with my Mother. The story's central character is Jane Hudson played by Hollywood legend Katharine Hepburn. 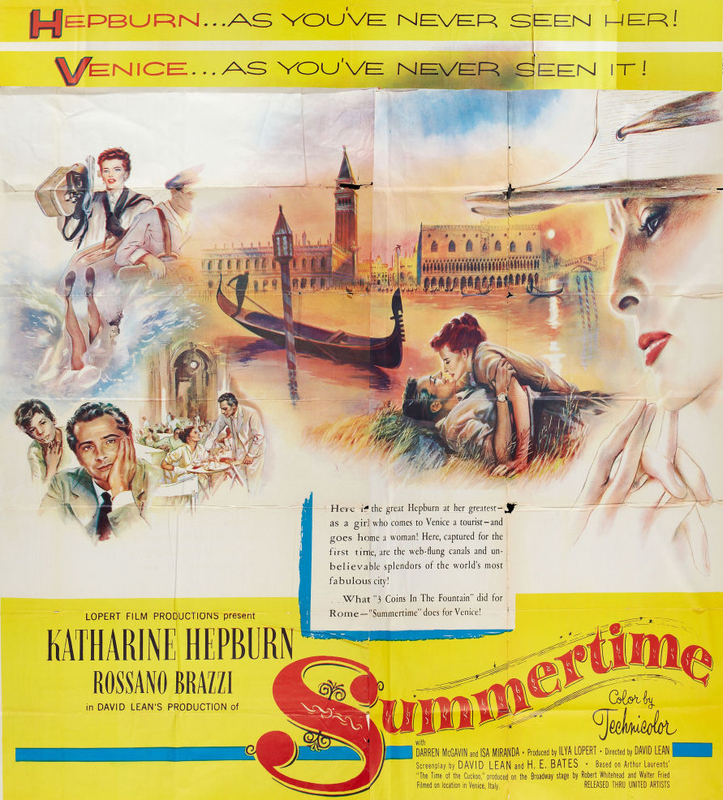 During a vacation to the "City of Romance" a middle-aged, single lady has a brief romance with a married Venetian antiques dealer played by Rossano Brazzi . 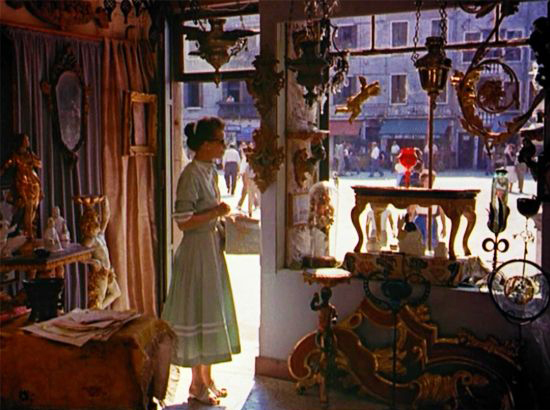 David Lean's own love affair with the city is evident as he makes such lavish use of the scenery that Venice itself becomes the star of the movie. While seated in a café in St Mark's Square, Hepburn's character becomes aware of a mysterious stranger (Brassi) watching her. The next day, she sees a striking red glass goblet in the window of an antiques store. She discovers that the shop owner is the same man whom she had been aware of the previous evening. Whilst filming the shop on her cine camera, she accidentally steps backwards and falls into a canal. 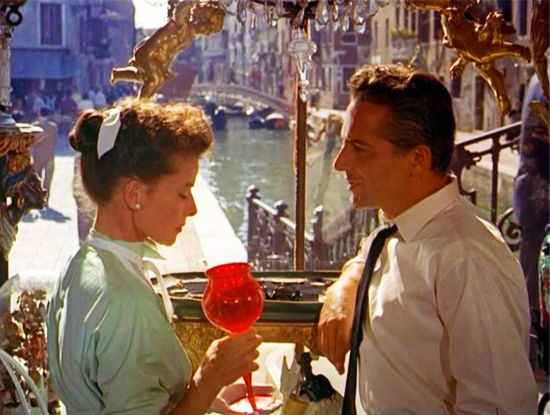 This famous scene was filmed in Campo San Barnaba. The wonderful thing about Venice is that so much changes, yet then again so little does. The shop is still there and now sells toys but otherwise is immediately recognisable. The greengrocer barge and gondolas are still present just as they were back in 1955. Some thirty years later Hollywood's cameras focused on Campo San Barnaba once again for scenes in Indiana Jones and the Last Crusade. I'll not divulge any more of the storyline from David Lean's film just incase you are tempted to settle down and watch it for yourself as a nostalgic Valentine's day treat. Dated and naive, but none the less an endearing and visually captivating film, ahh they don't make 'em like they used to. Buy from Amazon here.